I had mixed feelings about November’s March for Climate Action, one of the larger of several thousand events around the world on the weekend before the start of the COP21 talks in Paris. Of course we need to get action on climate change. I first got involved in environmental issues in my student days, though it was a little later that people really began to become widely aware of the problem of the ‘Greenhouse Effect’ and the importance of rising carbon dioxide levels, although this had been pointed out over a hundred years ago – the role of carbon dioxide was first theorised in the 1820s and experimental evidence came in the middle of the nineteenth century. It was obvious to Alexander Graham Bell back in 1917 that the world needed to move away from the unchecked burning of fossil fuels and towards alternative energy sources such as solar energy, but it is still something that successive governments here have failed to take with the necessary seriousness – and that our current administration is actually back-pedalling on. climate change is a threat to our continued existence on the planet. actions such as bush rejecting kyoto are grossly irresponsible, putting the short term interests of US companies before the planet. 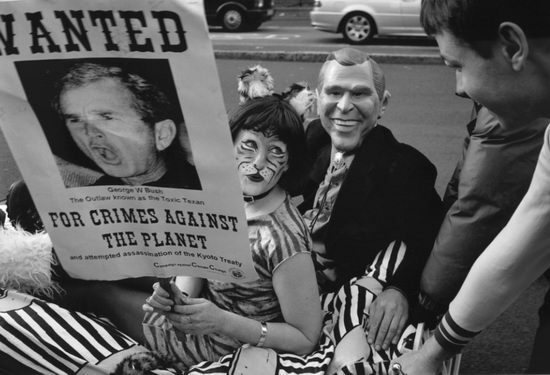 hence the demo with bush in bed with the esso tiger. On that occasion there were problems with the protest – apart from it being ignored by the mainstream media – with the wheels coming off the bed carrying Bus and the Esso tiger coming off as it was pushed up the slight incline of the approach to Westminster Bridge. 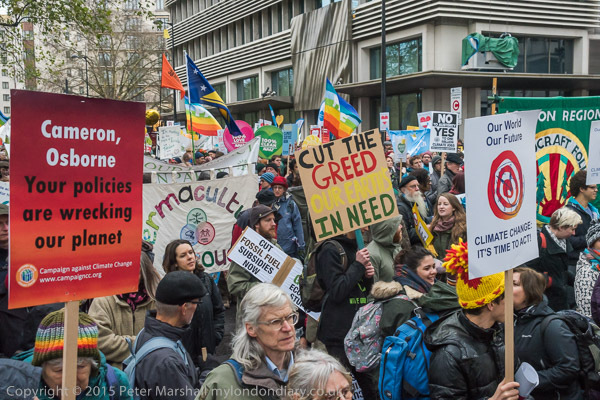 In later years the Campaign against Climate Change have organised many larger and more successful protests, and I’ve photographed most of them. 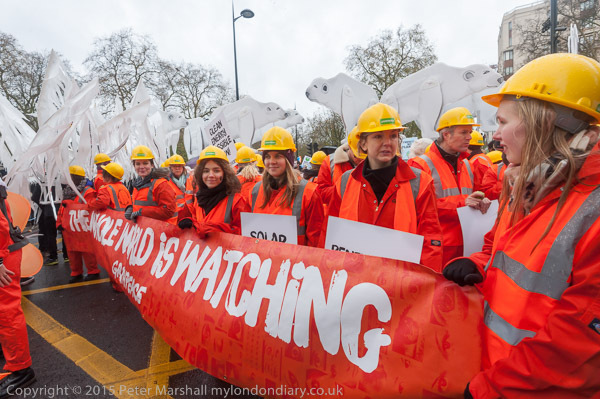 In more recent times, many other groups, including some large and well-funded charities, have come together to organise large climate marches, with groups such as the CACC being pushed to the sidelines. While its good that more people are becoming involved – and attracting more publicity – it sometimes has resulted in some of the real issues being sidelined. 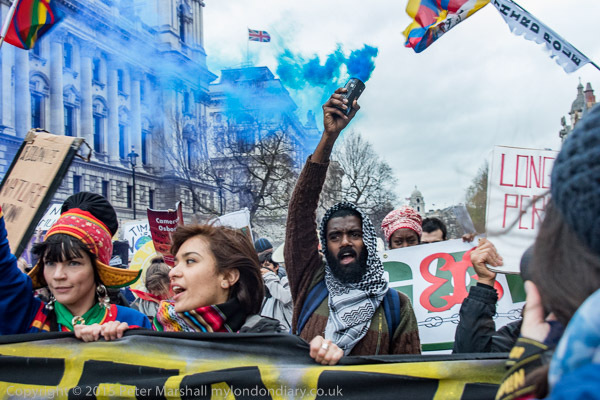 This year the wheels rather came off the protest,, when at the last minute some of the big charity backers decided that the Global Frontlines bloc which had been scheduled to lead the march was too radical for their taste, demanding global system change rather than minor adjustments. They tried to replace them with the main march banner along with performers in carnival animal costumes. It wasn’t a change the protesters were going to take lying down, and they regrouped in front of the main banner. This was the first time that I can recall that a security company had been employed to act as stewards for a protest march, and ordered to remove the Global Frontlines bloc they made threats, and tried to do so, with some pushing and shoving. The protesters simply refused to move, simply moving back after they were pushed away. In my hearing the organisers asked the police to intervene, but to their credit they refused. 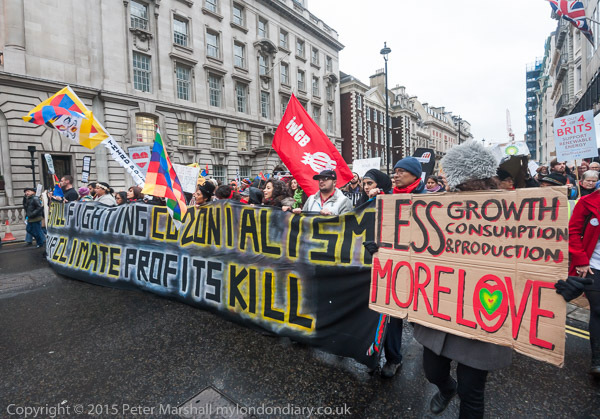 The banner at the front of the bloc read ‘STILL FIGHTING CO2ONIALISM YOUR CLIMATE PROFITS KILL’ and there were others with anti-colonial messages including ‘Extractivism is Colonialism’ and other anti-mining sentiments. 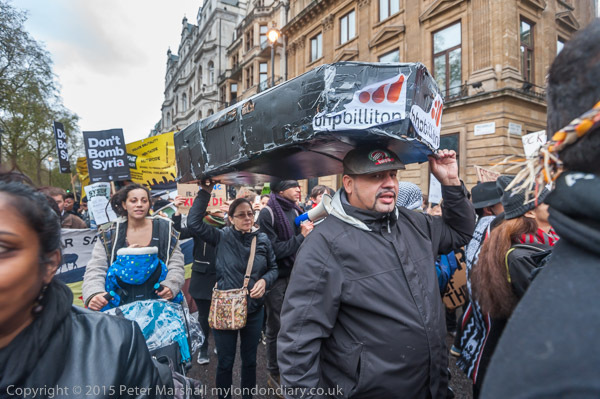 Apparently what worried the more conservative charities most was the message ‘British Imperialism causes Climate Change’ as well as two coffins naming companies BP and BHP Billiton. Eventually the protest split into two marches. 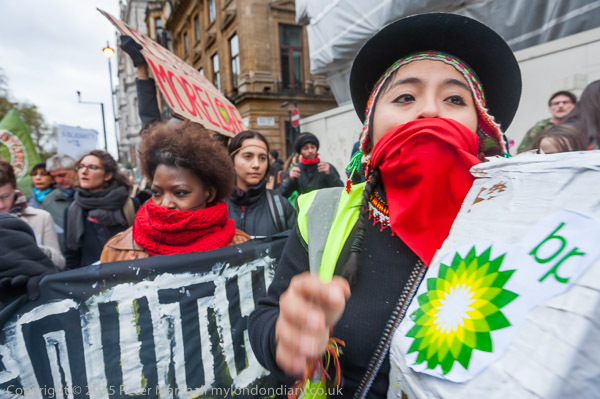 First came the Global Frontlines bloc, who marched along the planned route, with a sit-down blocking Pall Mall a few yards from BP’s head office, as a protest against that company’s environmental destruction around the world and its collaboration with brutal repression of workers in some projects. The rest of the march was held back for around ten minutes to create a gap between the furry carnival and the Global Frontlines. But other protesters also moved in front of the main banner, and by the time those sitting down on Pall Mall decided to continue, the march had more or less become one again as it went down Whitehall to the rally on Millbank. But there was a very bad taste left in my mouth. 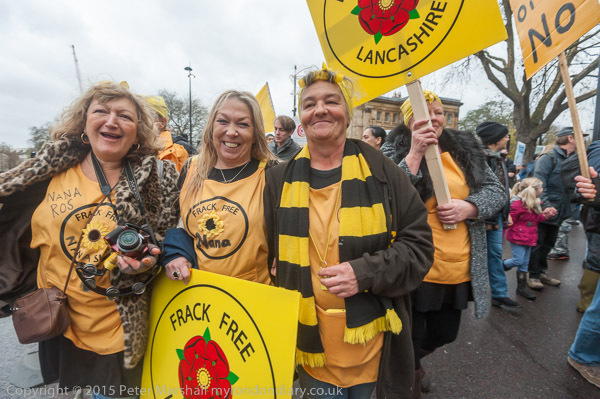 The rally was frankly anodyne, and I met a number of long-term climate campaigners who told me that their groups had not been allowed to take part in it, as those in charge were determined that it should not be ‘political’. There had been politicians and others at a rally on Park Lane before the start of the march, but only those of the protesters close to the stage were able to hear. This entry was posted on Thursday, May 19th, 2016 at 10:15 am and is filed under My Own Work, Political Issues. You can follow any responses to this entry through the RSS 2.0 feed. You can leave a response, or trackback from your own site.